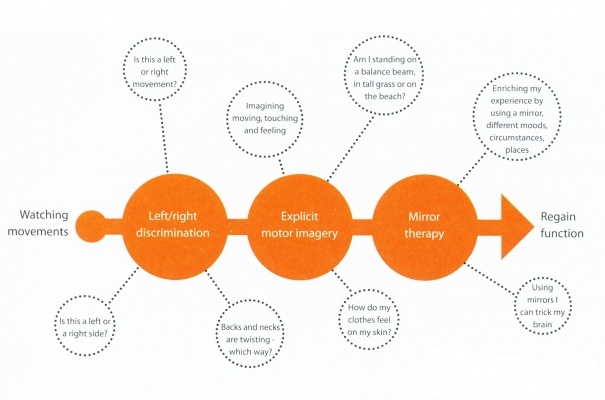 The principle of mirror therapy (MT) is the use of a mirror to create a reflective illusion of an affected limb in order to trick the brain into thinking movement has occurred without pain. It involves placing the affected limb behind a mirror, which is sited so the reflection of the opposing limb appears in place of the hidden limb . 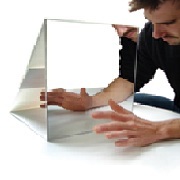 A Mirror box is a device which allows the clinician to easily create this illusion. It' is a box with one mirror in the center where on each side of it, the hands are placed in a manner that the affected limb is kept covered always and the unaffected limb is kept on the other side whose reflection can be seen on the mirror. Mirror therapy was invented by Vilayanur S. Ramachandran to help alleviate thePhantom limb pain, in which patients feel they still have a pain in the limb even after having it amputated. Ramachandran and Rogers-Ramachandran first devised the technique in an attempt to help those with phantom limb pain resolve what they termed a ‘learned paralysis’ of the painful phantom limb. The visual feedback, from viewing the reflection of the intact limb in place of the phantom limb, made it possible for the patient to perceive movement in the phantom limb.Their hypothesis was that every time the patient attempted to move the paralyzed limb, they received sensory feedback (through vision and Proprioception) that the limb did not move. This feedback stamped itself into the brain circuitry through a process of Hebbian learning, so that, even when the limb was no longer present, the brain had learned that the limb (and subsequent phantom) was paralyzed. To retrain the brain, and thereby eliminate the learned paralysis, Ramachandran and Rogers-Ramachandran created the mirror box. The patient places the good limb into one side, and the stump into the other. The patient then looks into the mirror on the side with good limb and makes "mirror symmetric" movements, as a symphony conductor might, or as we do when we clap our hands. Because the subject is seeing the reflected image of the good hand moving, it appears as if the phantom limb is also moving. Through the use of this artificial visual feedback it becomes possible for the patient to "move" the phan tom limb, and to unclench it from potentially painful positions. 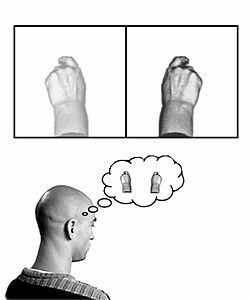 This approach exploits the brain’s preference to prioritise visual feedback over somatosensory/proprioceptive feedback concerning limb position. In conditions such as phantom limb pain (PLP), stroke, or Chronic Regional Pain Syndrome Type 1 (CRPS1) where neuropathic processes cause issues with pain, related or unrelated to movement, this approach is thought to offer potential relief . Most of the evidence since the early work has come from case studies and anecdotal data. Chan et al (2007) allocated 22 patients with Phantom Limb Pain (PLP) into a mirror therapy group, mental imagery group and a covered mirror group (control) . They reported that all patients in the mirror therapy group experienced reduced PLP. This was not the case in the other two groups. The study did not control potential biases and its methodology was not described in detail, so weakening the power of its findings. A more robust trial investigated two groups of subjects suffering with PLP . A mirror group were compared to a covered mirror group, however, there were no statistically significant reductions in PLP between groups. In 2011 a large scale review of the literature on mirror therapy by Rothgangel summarized the current research as follows:"For stroke there is a moderate quality of evidence that MT as an additional intervention improves recovery of arm function, and a low quality of evidence regarding lower limb function and pain after stroke. The quality of evidence in patients with complex regional pain syndrome and phantom limb pain is also low. Firm conclusions could not be drawn. Little is known about which patients are likely to benefit most from MT, and how MT should preferably be applied. Future studies with clear descriptions of intervention protocols should focus on standardised outcome measures and systematically register adverse effects". A further review of current approaches in the treatment of PLP concluded that the benefits of mirror therapy appear to be limited to patients who suffer from cramping and muscular-type phantom pain . They noted that despite the findings of one RCT, there was no systematic evidence to support the use of this modality and even some suggestion it could be counterproductive. 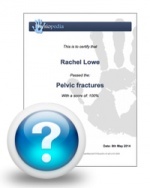 However, this may be due to study design, choice and size of sample and application of the modality . Diers et al (2010) noted that applying MT as part of a sequence of modalities appeared to produce positive results against applying it in isolation . In an RCT, patients with CRPS1 and PLP showed decreases in pain, and improved function both immediately post treatment and at a 6 month follow-up when using mirror training as part of a sequence of modalities known as Graded Motor Imagery (GMI). Mirrored imagery alone did not, however, activate cortical processes in patients with phantom limb pain. The authors concluded that further research was required to establish the cortical processes underlying MT and motor imagery in order to guide the optimal method of application for these modalities. These findings appeared to support earlier suggestions that whilst mirrored movements may expose the cortex to sensory and motor input, the therapeutic effect is magnified if cortical networks were gradually activated using limb recognition, motor imagery and finally mirrored movement .This sequence of modalities became known as GMI. Using a single blind randomised control design this approach was investigated with patients suffering with PLP, CRPS and brachial plexus avulsion. Whilst the heterogeneity of the sample was acknowledged, it was argued that cortical similarities exist between these conditions causing a cortical neglect of the affected limb leading to changes in cortical mapping. The sample size in each study was small, but both studies showed significant reductions in pain and cortical reorganisation following a six week program. Graded Motor Imagery (GMI) is a rehabilitation process used to treat pain and movement problems related to altered nervous systems by exercising the brain in measured and monitored steps thatgradually expose the cortex to sensory and motor input and so enable cortical networks to open up in response. GMI has become accepted as a method of treating neuropathic pain and associated movement disorders. By exercising the brain in measured and monitored steps the approach seeks to gradually exposure the cortex to sensory and motor input and so enable cortical networks to open up in response. These techniques are delivered sequentially but require a flexible approach from the patient and clinician to move forwards, backwards and sideways in the treatment process to suit the individual. A recent Cochrane Reviewsummarised the effectiveness of mirror therapy for improving motor function, activities of daily living, pain and visuospatial neglect in patients after stroke. 14 studies with a total of 567 participants that compared mirror therapy with other interventions were compared. At the end of treatment, mirror therapy improved movement of the affected limb and the ability to carry out daily activities, it reduced pain after stroke, but only in patients with a complex regional pain syndrome and the beneficial effects on movement were maintained for six months, but not in all study groups. Working with patients with different complex regional pain syndromes can be challenging. Pharmacological therapies are often associated with variety of side effects. Mind-body modalities are thought to play a role; however, the lack of clear consensus and large body of clinical experience makes it hard to provide good evidence-based recommendation to most of our chronic pain patients.Current evidence supports the use of Mirror Box Therapy. MT is a non-pharmacological and alternative treatment strategy that has been proposed as a means of managing PLP. It is a neuro-rehabilitation technique designed to remodulate cortical mechanisms. With this technique, patients perform movements using the unaffected limb whilst watching its mirror reflection superimposed over the (unseen) affected limb. This creates a visual illusion and provides positive feedback to the motor cortex that movement of the affected limb has occurred. The approach is thought to offer potential relief through the visual dominance upon motor and sensory processes. Considering the importance of PLP and its management, MT offers clinicians an easy-to-use and low-cost adjuvant therapeutic technique. However, its effectiveness as a stand alone modality largely arises from low quality evidence. Instead, there is a greater weight of evidence in favour of its use as a combined or sequential therapy, such as Graded Motor Imagery . ↑ Ashu Bhasin, MV Padma Srivastava, Senthil S Kumaran, Rohit Bhatia, Sujata Mohanty, Neural interface of mirror therapy in chronic stroke patients: A functional magnetic resonance imaging study, 2012, Neurology India, 60, 6, 570-576. ↑ Chan B, Witt R, Charrow A, et al. Mirror therapy for phantom limb pain. N Engl J Med 2007;357:2206–7. ↑ Brodie E, Whyte A, Niven C. Analgesia through the looking glass? A randomized controlled trial investigating the effect of viewing a ‘virtual’ limb upon phantom limb pain, sensation and movement. Eur J Pain 2007;11:428–36. ↑ 11.0 11.1 Moseley GL. Is successful rehabilitation of complex regional pain syndrome due to sustained attention to the affected limb? A randomised clinical trial. Pain 2005;114:54–61. ↑ 12.0 12.1 Moseley GL. Graded motor imagery for pathologic pain: a randomized controlled trial. Neurology 2006; 67:2129–34. ↑ Thieme H, Mehrholz J, Pohl M, Behrens J, Dohle C. Mirror therapy for improving motor function after stroke. The Cochrane Library, 14 March 2012. ↑ Lamont K, Chin M, Kogan M., Mirror box therapy: seeing is believing. Explore (NY). 2011 Nov-Dec;7(6):369-72. ↑ Bowering KJ, O'Connell NE, Tabor A, Catley MJ, Leake HB, Moseley GL, Stanton TR., The effects of graded motor imagery and its components on chronic pain: a systematic review and meta-analysis. J Pain. 2013 Jan;14(1):3-13. doi: 10.1016/j.jpain.2012.09.007. Epub 2012 Nov 15.